Balentine is pleased to announce CEO Adrian Cronje as an honoree for the 2018 “Top Entrepreneur Awards” presented by TiE Atlanta. Adrian will be recognized alongside five honorees in the Middle Market Entrepreneurs category for this award. In total, thirteen Atlanta startups have been announced as honorees by TiE Atlanta. 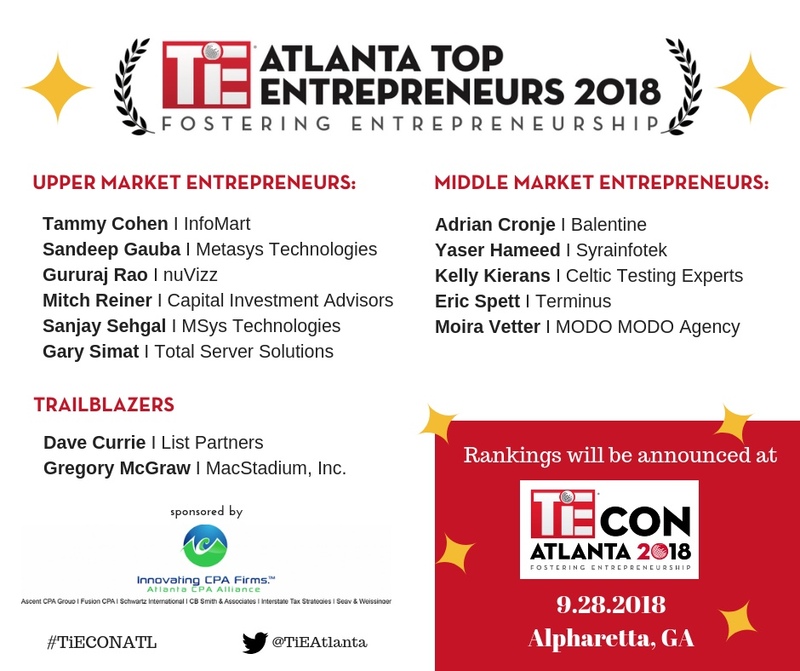 The finalists will be ranked and recognized at TiECON Atlanta, the annual entrepreneur conference hosted by TiE Atlanta, on September 28 at The Hotel at Avalon in Alpharetta, GA. The 2018 TiE Top Entrepreneur Awards recognize Atlanta startups and companies that have made a minimum revenue of $2 million and no more than $100 million in 2017. The awards are based on revenue growth, profitability, sustainability, leadership, culture, and innovation. The honorees represent companies in a wide range of industries, including blockchain technology, finance, Information Technology, real estate, marketing, software, and more. The selected and honored entrepreneurs of Metro Atlanta will be ranked 1-10 over three categories: Middle Market, Upper Middle Market and Trailblazers. Read more about TiECON 2018.